Try this delightful *FREE! * 3D runner brought to you by an award-winning team, featuring soundtracks by Disasterpeace - composer of the award-winning Xbox Live Arcade hit FEZ. • Simple "touch & tilt" controls - everyone can play! • Full social media integration - share high scores and pictures via Facebook and Twitter, making it fun for all your friends and family. 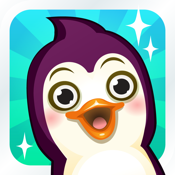 Choose from a number of adorable penguins to run, jump, and fly your way to victory against the evil octopuses, collecting delicious fish and rescuing as many other penguins as possible along the way.